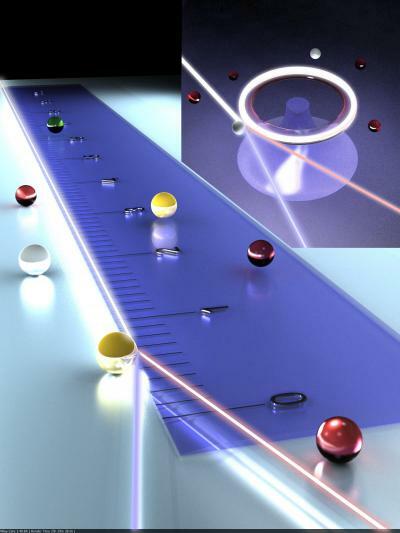 A tiny doughnut-shaped laser is the latest marvel of silicon microminiaturization, but instead of manipulating bits it detects very small particles. Small particles play a big — and largely unnoticed — role in our everyday lives. Virus particles make us sick, salt particles trigger cloud formation, and soot particles sift deep into our lungs and make it harder to breathe. The sensor belongs to a category called whispering gallery resonators, which work like the famous whispering gallery in St. Paul’s Cathedral in London, where someone on the one side of the dome can hear a message spoken to the wall by someone on the other side. Unlike the dome, which has resonances or sweet spots in the audible range, the sensor resonates at light frequencies. Light traveling round the micro-laser is disturbed by a particle that lands on the ring, changing the light’s frequency. The ring can count the touch-down of as many as 800 nanoparticles before the signals begin to be lost in the noise. By exciting more than one mode in the ring, scientists can double-check the accuracy of the count. And by changing the “gain medium,” they can adapt the sensor for water rather than air. Lan Yang, PhD, assistant professor of electrical and systems engineering at Washington University in St. Louis who leads the team that fabricated the new sensor, says that there is already lively interest in its commercialization in fields ranging from biology to aerosol science. The sensor is described and characterized in the June 26 online edition of Nature Nanotechnology. A whispering gallery resonator supports “frequency degenerate modes” (modes, or patterns of excitation in the ring, with the same frequency, one traveling clockwise and the other counterclockwise around the ring. The mode fields have “evanescent tails” that penetrate the surface of the ring and probe the surrounding medium. When a particle lands on one of the “hot spots” it scatters energy from one of the modes into the other, and the modes adopt slightly different resonance frequencies. This is referred to as mode splitting. The new sensor differs from earlier whispering gallery resonators in that it is itself a miniature laser rather than the resonating cavity of an external laser. The new sensor is also glass but glass laced with atoms of the rare earth elements that serve as a “gain medium.” The glass is doped with rare-earth atoms and when an external light source boosts enough of them into an excited state, the ring begins to lase at its own preferred frequency. When a particle lands on the microlaser, a single lasing line splits into two slightly different frequencies. A simple way of measuring the frequency splitting is to mix the split laser modes in a photodetector, which produces a “beat frequency” that corresponds to the frequency difference. The microlaser is orders of magnitude more sensitive than the passive resonator, she says. Its effective resolution limit is about one nanometer. One nanometer is to a meter, what a marble is to the Earth. The effect of a particle on a lasing mode depends on the particle’s “polarizability,” which is a function of its size and refractive index. To cover the possibilities, the Washington University team tested the micro-laser’s performance with nanoparticles of various sizes made of various materials, including polystyrene (packing peanuts), virions (virus particles) and gold. As particles enter the “mode volume” of the micro-laser one by one, the scientists can see a discrete upward or downward jump in the beat frequency. Each discrete jump signals the binding of a particle on the ring, and the number of the jumps reflects the number of particles. Because the “resonator field” traps the particles on the resonator, once landed, they rarely drop off. But the team found they were able to count many particles before the losses induced by the particles made the laser linewidths so broad they couldn’t detect changes in frequency splitting due to the latest arrival. For example, they were able to detect and count as many as 816 gold nanoparticles using the same laser mode. That’s an advantage, he explains, because the beat frequency depends in part on where the particle lands on the ring. If there is only one laser line and the particle falls between “hot spots” it might not be detected. The second beat frequency prevents these “false negatives,” ensuring that every particle produces a detectable beat frequency. Yang’s team has already begun working to make use of the enhanced sensitivity provided by the microlaser for studying various problems. In terms of applications, “the near-term use will be the monitoring of dynamic behaviors of particles in response to environmental and chemical changes at single particle resolution,” says Yang. The next step, the team see is to engineer the surface of these tiny microlasers to detect DNA and individual biological molecules. If the DNA is tagged with engineered nanoparticles, the micro-laser sensor can count individual DNA molecules or fragments of molecules. Listening to Yang it is hard to escape the impression that you’re hearing for the first time about an astonishing device that will one day be as ubiquitous — and probably as underappreciated — as the logic gates in our microwaves, cellphones and cars.